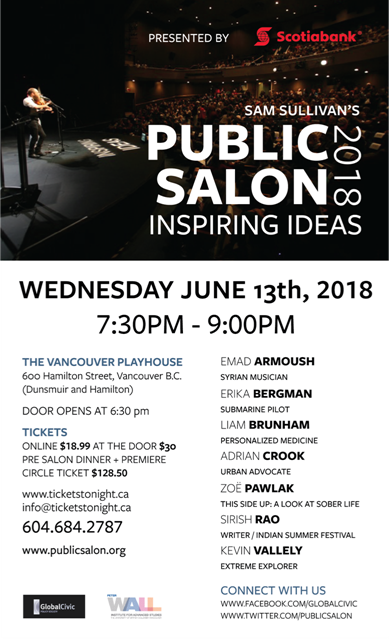 Dr. Liam Brunham, Assistant Professor in the Division of General Internal Medicine is participating as a speaker at the June 13, 2018 Sam Sullivan’s Public Salon. For 10 Years Global Civic Founder Sam Sullivan hosted private salons over dinner with about 10 invited guests from a broad cross-section of the community. His friend and mentor Prof. Abraham Rogatnick was a frequent guest and just before he died he urged Sullivan to bring the benefits of the salon to a broader public. As a tribute to his friend Abraham, Sullivan decided to do just that. The Public Salon presents public policy ideas and promotes public discussion of them. Liam Brunham is an Assistant Professor in the Department of Medicine at the University of British Columbia and a Principal Investigator at the UBC Centre for Heart and Lung Innovation. He is an attending physician at the Health Heart Program Prevention clinic at St. Paul’s hospital, one of the largest specialty lipid clinics in Canada. He is a Canadian Institutes of Health Research (CIHR) New Investigator and a Michael Smith Foundation for Health Research Scholar. In 2017, he was recognized as one of Canada’s Top 40 under 40. Dr. Brunham’s research focuses on genetic aspects of cholesterol levels, cardiovascular disease (CVD), and pharmacogenomics. Active projects in his laboratory include SAVE BC, a long term study of families with early onset CVD, which he is co-leading with Dr. Simon Pimstone; using genome-editing in human stem cells to study mechanisms of drug-induced cardiotoxicity; and studying the use of genetic testing for inherited dyslipidemias. His laboratory is funded by the CIHR, Heart & Stroke Foundation of Canada, Canada Foundation for Innovation, and Genome BC. Congratulations to Dr. Brunham on this achievement and for his contributions to the Department of Medicine and to our community.